In my last post I discussed conflicting views of how Japanese-Americans ought to handle the internment. 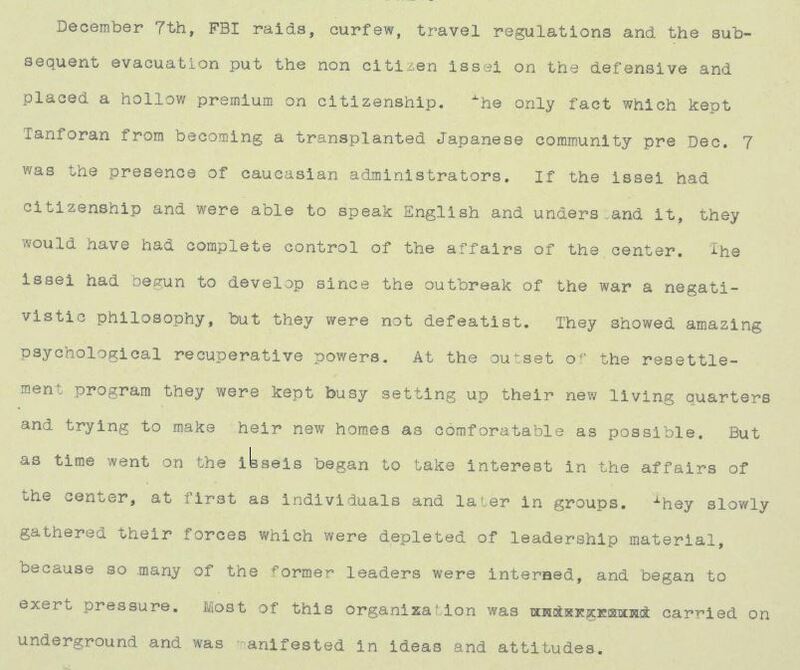 For the sake of ease, I characterized those who wanted internees to be cooperative with and supportive of the government as pro-JACL, and those who took a more negative view of the situation as anti-JACL. Over the course of the detention, there was a great and growing distrust of the government on the part of many detainees. Skepticism was not in short supply and the Anti-JACL attitude seemed to be spreading as a result. Many Issei (as well as some Nisei) were busy organizing among the detainees. Of course, for some, this took place from the start. For example, one observer of the Tanforan detention center from which people were sent to permanent internment camps wrote that some “had begun to develop … a negativistic philosophy … [They] slowly gathered their forces … and began to exert pressure [on other detainees]. Most of this organization was carried on underground and was manifested in ideas and attitudes” (Kunitani, Tanforan Politics, p. 14). There still could be no true resistance on the part of the underground groups, though, as they had nothing to resist. Within the detention centers, any service or cooperation they withheld would only hurt detained Japanese as a group — as much of the work done in the centers directly benefited center occupants — and draw the scorn of the coercive arm of the United States government– imprisonment and loss of citizenship were a constant threat. Both Issei and Nisei organized nonetheless. Much of the underground organizing was explicitly in opposition to what had come to be seen as the pro-administration stance of the JACL. Those with Pro-JACL views and JACL members especially were called “inu” — literally, dogs. 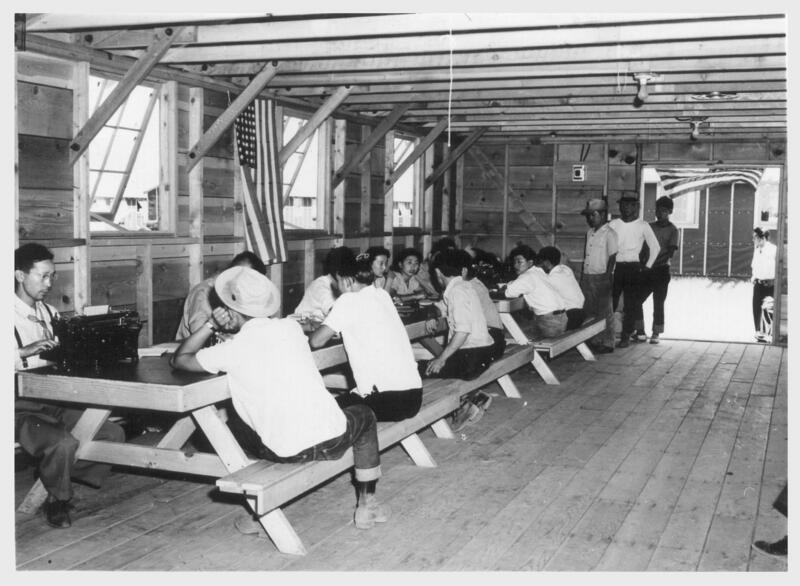 In Tule Lake Relocation Center (Newell, California), a group organized under the name “Japanese American Liberators.” According to internee Shotaro Frank Miyamoto, “The inception of the group probably was caused by two main aims, on the one hand, to have an organization of the Nisei in opposition to the JACL, and on the other, to organize the Nisei for vigorous action to save themselves from the pressure of anti-Japanese feeling rising in this country” (Japanese American Liberators, BANC MSS 67/14 c, folder R 20.25). Thus, the nascent organization for collective resistance was undeniably present at Tule Lake. But once more the question arises, resistance to what? The government controlled nearly every aspect of their lives: school, work, recreation, food. The slightest disturbance could result in denial of privileges, and the ease with which the government corralled and caged those of Japanese ancestry raised questions in many minds as to the grave consequences of a collective action. These manifold deterrents notwithstanding, widespread collective resistance eventually occurred inside the internment camps. 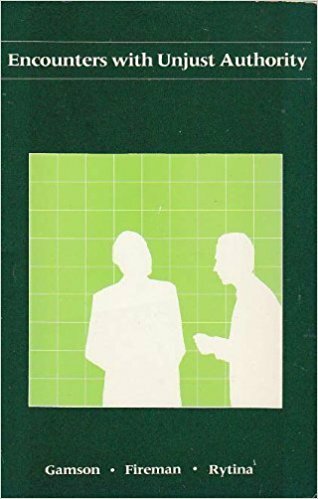 The term “critical incident” is from William A. Gamson, Bruce Fireman, and Steve Rytina, Encounters with Unjust Authority (Homewood, IL: Dorsey Press, 1982). Early in 1943, less than a year into the detention, there was an event — the government program of registration of detainees for Selective Service and clearance for leave from the centers — which greatly increased the capacity of detainees for organized resistance. It was a “critical incident” and immediately thereafter the most intense and widespread collective resistance of the entire evacuation and detention program occurred. According to the War Relocation Authority Tule Lake Reports Officer, “When the War Department announced on January 28  the proposed formation of a combat team composed of American citizens of Japanese ancestry to be recruited by the United States Army for active service in a theater of war, and the mass clearance of loyal Japanese-Americans for work on the outside [of the centers], the curtain was raised on a drama so moving and so fraught with human emotions that the repercussions will effect in varying degrees the lives of many Tule Lake [detainees] for years to come” (John C. Cooks, Selective Service and Leave Clearance Programs at Tule Lake-An Historical Survey, BANC MSS 67/14 c, folder R 6.05, p. 1). The legitimacy of the government had already decreased in the eyes of many during the course of evacuation and detainment, and the proposal put forward by the War Department of registration for Selective Service and leave clearance was seen as grossly unfair. A program of registration under ordinary circumstances surely would not have met much organized resistance. The various levels of the state regularly require its subjects to file information: automobile registration, Selective Service registration, birth and death certificates, taxes, Social Security, drivers’ licenses, etc. In the sensitive atmosphere of the relocation centers, though, it would take only a small spark to ignite the mounting feeling of resentment and unleash a full-fledged movement. In order to form a Japanese-American combat team and to approve leave clearances for resettlement, the government needed to determine who in the camps was “loyal” and who was “disloyal.” This would be done by means of a registration questionnaire to be filled out by all detainees. Loyalty would be determined by responses to the questionnaire, specifically two questions: #27 and #28 (the so-called “loyalty questions”). These two questions had to be answered in the presence of a US Army officer. The objections to the questionnaire were manifold, and according to Cooks, “The [questionnaire] struck the project like a bomb.” It was a bomb that would create the most widespread and passionate resistance in the life of the centers. Detainees who decided to join the resistance to the Selective Service and leave clearance program could do so in several ways. The army wanted the Japanese­ American combat unit to consist of volunteers, not inductees. Not volunteering, then, was a subtle but powerful action. Also, refusing to register would greatly impede the process of determining “loyalty.” Those who went through the registration process could (and did) signify their discontent by answering “NO” to questions 27 and 28. They could also offer qualified answers to either. Finally, the most serious form rejection of the US government could take was the request for repatriation to Japan. In my review of the documents, it appears that all of these methods of resistance were employed, in varying degrees, in nearly every camp. Tule Lake, Newell, Calif.–A view of Selective Service registration headquarters — Photographer: Stewart, Francis — 6/30/42. Courtesy UC-Berkeley Bancroft Library. At Tule Lake, for example, an army team explained the Selective Service and leave clearance programs on February 9th, and registration was to proceed block by block beginning on the 10th. Cooks recounts the unprecedented events: “Registration was slow. Wednesday evening, February 10, colonists met in their respective mess halls at the behest of their block managers. The following blocks decided against registration for induction or for indefinite leave: 5, 28, 35, 46, and 48. 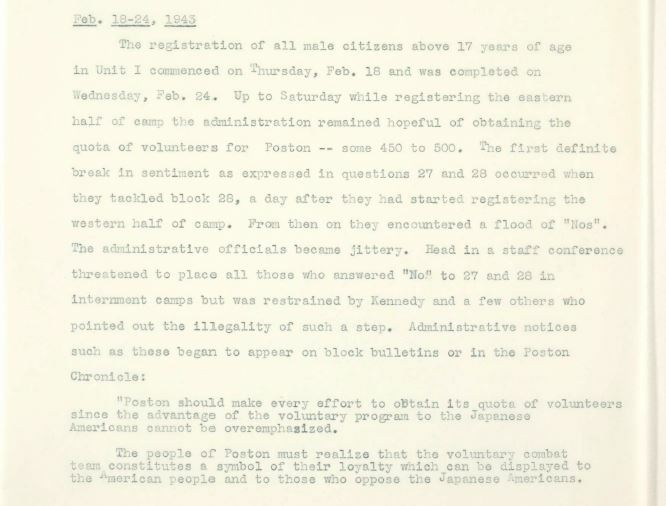 The block manager of Block 28 tenta­tively explained that the residents of his entire block wish[ed] to repatriate … Enemies of the selective service and leave clearance programs were busy, apparently, because threats on the lives of a number of colonists had already been made, particularly persons prominently identified with the JACL … By Thursday, February 11, it was obviously apparent that there was organized resistance to the registration program … It was apparent that there was a subversive group operating behind the scenes, intimidating col­onists and urging non-cooperation with the selective service and leave clearance programs. 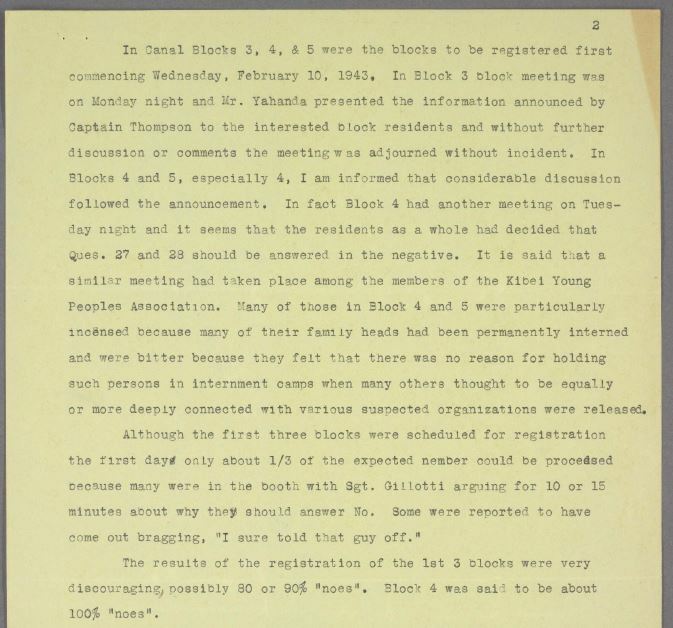 This explanation of the early events by a WRA official suggests three things happening at Tule Lake internment camp: one, that there was widespread resistance to the registration program, and by extension to the government itself. Two, that the resistance was organized and collective. Three, that there was direct hostility toward the JACL and its followers. On the other side of the issue, Kentaro Takesui explained very simply why he did not register. Refusal to register was “a symbol of our resentment against oppression. The suppressed emotional bitterness that was boiling upwards had to have an outlet and this was it.” Indeed, in many respects, registration was not even the issue. 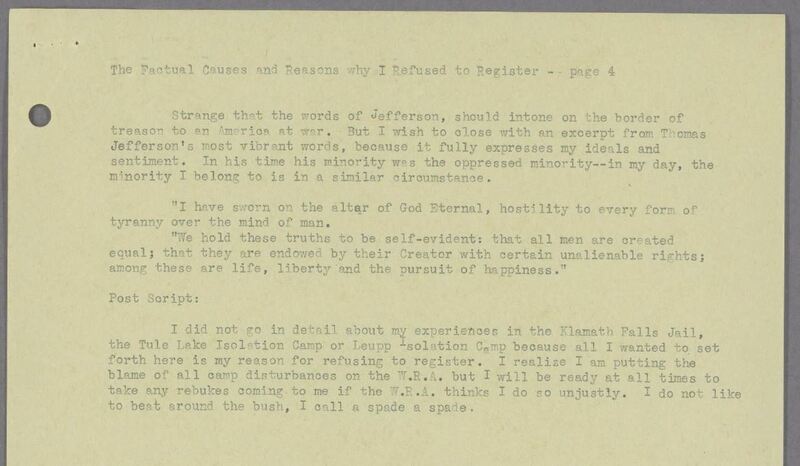 As Takesui wrote, “the issue and question of registration became of secondary importance” (The Factual Causes and Reasons Why I Refused to Register and A General Summary of the “Registration Incident” at Tule Lake, BANC MSS 67/14 c, folder R 30.25). What was truly important was that the delegitimized government was trying to institute a program which made demands deemed unfair by many detainees. The organizations and ideas for resistance already existed; thus, when the opportunity arose for the detainees to withhold something which the government wanted (their bodies for war and their statement of loyalty), it was seized. By no means was resistance to the registration program limited to Tule Lake. Guy Robertson, Heart Mountain Project Director, wrote to Dillon Myer, WRA Director, “Our registration is practically complete at Heart Mountain and in many ways it has been very discouraging … I have felt, and I still feel, that there has been an undercurrent of resistance” (Induction, Registration and Selective Service, Folder M 3.00, Barnhart Catalog). James Lindley, Granada Project Director, similarly wrote to Myer, “originally 106 military aged citizens answered Question No. 28 in the negative. At the same time this information was tabulated, we had 31 volunteers for the Combat Team, which appeared to me to be a rather heavy ratio in the wrong direction” (Induction, Registration and Selective Service, Folder L 8.00, Barnhart Catalog). At Gila River, “The results of registration of the first three blocks were very discouraging, possibly 80 or 90% [‘no’ responses to question 28]. Block four was said to be about 100% ‘noes'” (Omachi, Draft Registration, BANC MSS 67/14 c, folder K8.28, p. 2). At Poston, “[The officials] encountered a flood of ‘Nos.’ The administrative officials became jittery. 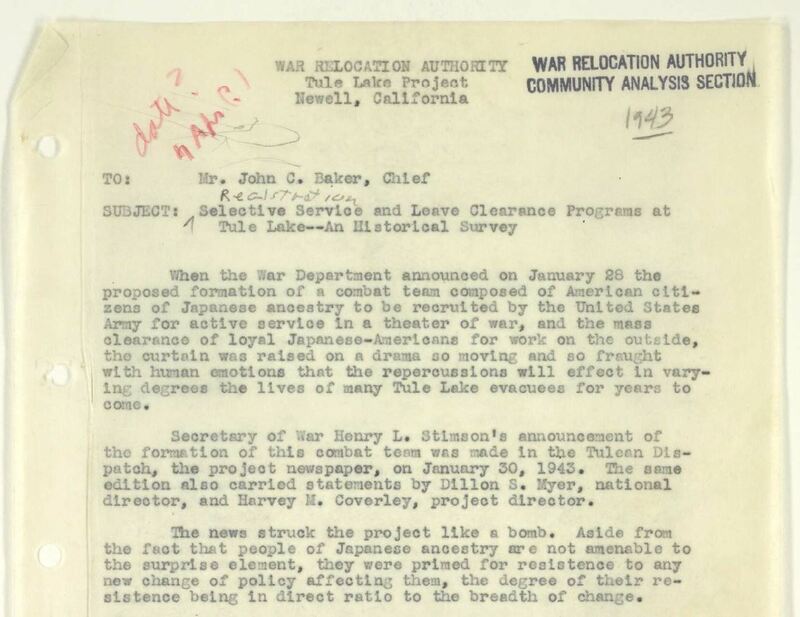 [Project Director Wade] Head in a staff conference threatened to place all those who answered ‘No’ to 27 and 28 in internment camps but was restrained by [Employment Chief] Kennedy and a few others who pointed out the illegality of such a step” (Tamie Tsuchiyama, Notes on Selective Service Registration, BANC MSS 67/14 c, folder J6.23, p. 16). It seems abundantly clear, then, that resistance to registration was neither slight, nor isolated. The koi (carp) in Japanese culture is a symbol of strength, and the saying translates to “swimming up a waterfall like the carp.” It means overcoming any hardships one is confronted with. 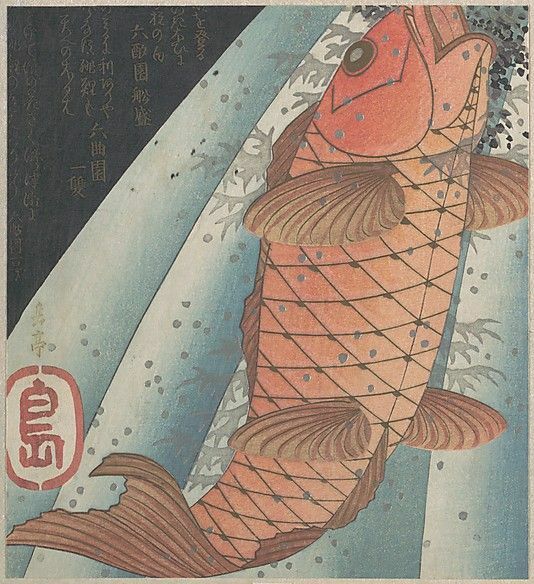 One Issei wrote from Gila River, “We see quite a few [carp in] gardens in our camp swimming gayly, and I like to stop very often to watch them — the emblem of undaunted spirit” (The Pros and Cons of Situation, Folder K 12.10, Barnhart Catalog, p. 24). 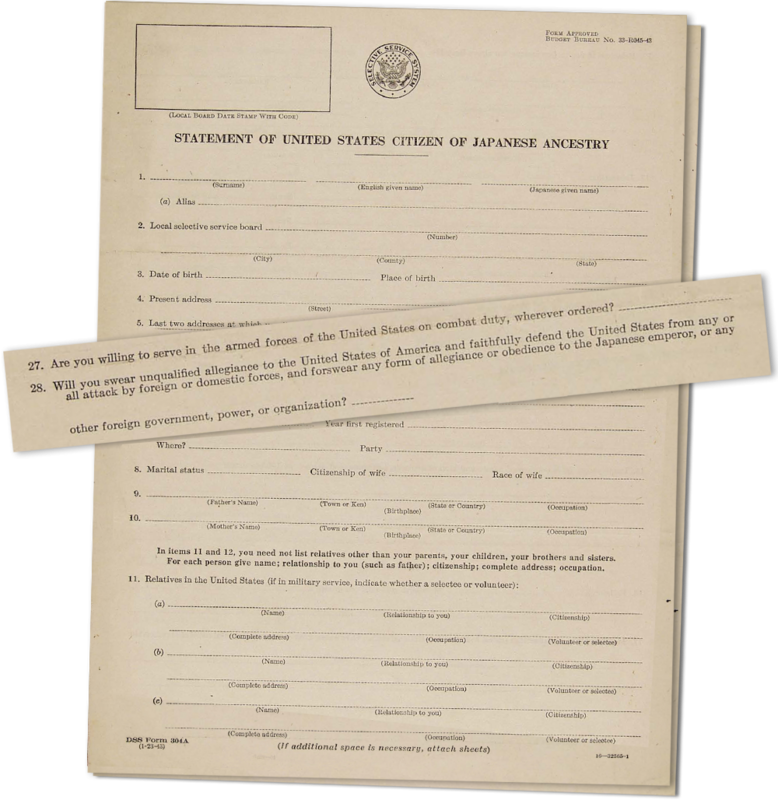 That undaunted spirit was evident not only during the resistance to the loyalty questionnaire but also when, out of the dust and barbed wire of concentration camps, people of Japanese ancestry rose to success in American society after World War II. [*] “A total institution may be defined as a place of residence and work where a large number of like situated individuals, cut off from the wider society for an appreciable period of time. together lead an enclosed, formally administered round of life.” Erving Goffman. Asylums: Essays on the Social Structure of Mental Patients and Other Inmates (Chicago: Aldinc Publishg Company, 1962), xiii. Because the detainees had some personal space and freedom of movement and thought, the centers were not as extreme as the mental hospitals Goffman studied. There was thus much less mortification and curtailment of the self. While still being a total institutions by Goffman’s definition, these variations should be noted.